Excavated from an archaeological site in modern-day Israel, this ancient glass dates back to the period of the Romans who were master craftsmen in the glass industry. Treasure each creation as your own unique piece of history. 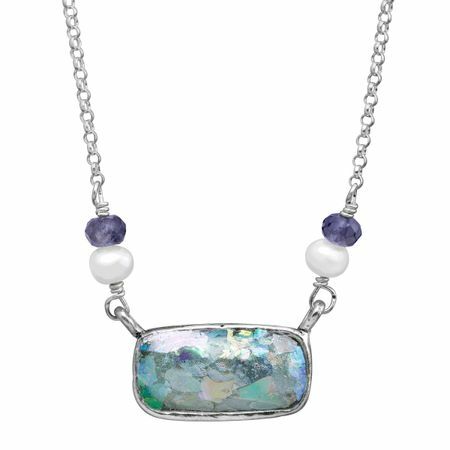 Take your style to the limits with this multi-stone piece - ancient Roman glass is flanked by purple iolites and freshwater pearls in a setting of sterling silver for a look that's chic yet everyday. Feature piece measures 7/16 by 3/4 inches. Necklace measures 18 inches in length and features a lobster clasp. Piece comes with a ".925" sterling silver stamp as a symbol of guaranteed product quality.